Congratulations to our RUGDEALER whose article on the search for the identity of “the man on the carpet” got published and translated to German in the Carpet Collector magazine in Germany. We are proud of you! 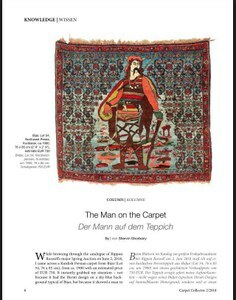 After all the giggles I remembered that I have seen a similar carpet in a book called “Iranian Carpets: Art, craft and History” by E. Gans-Ruedin on page 440. There is a carpet from Kerman dated 1896 in the collection of The Carpet Museum of Iran, Tehran, dimension 195 x 131 cm with an inscription in French: “Guerrier Franc” translating to Frankish warrior. Behind the warrior on this rug lies a dead soldier. The cartouche gives the following indications: Prince Abdul Hossein commander-in-chief (Farman farma), chief warrior (Salar lashghar) date 13/13 (1896). I published this new clue to Facebook and my friend, Fawzan Shaltout, mentioned that it could by “Don Giovanni”. Other guesses were “Alexander the Great” and “Robin Hood”. I was very happy to settle for “Don Juan” because to my surprise there was a Persian character called Uruch Beg later known by his baptized name of “Don Juan” (1560 – 1604) in Spain. He was also known as Faisal Nazary, a native Iranian from the Bayat Qizilbash clan. He later moved westward, settled in Spain and converted to Roman Catholicism. 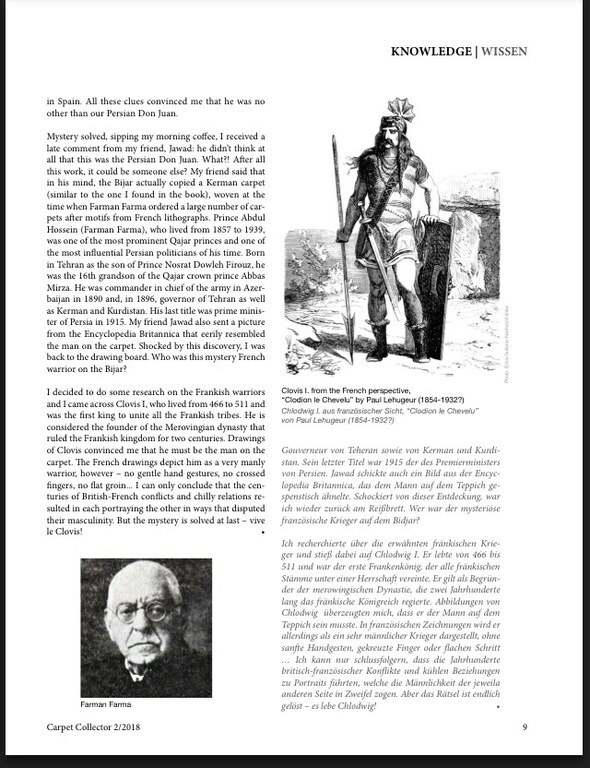 Whilst in Spain he wrote an account of Iran, his involvement there with Shah Abbas first, and his journey to Spain in the Persian Embassy sent to Europe later. He was killed in 1604 during a street fight in Spain. All these clues made me believe that we are talking about none other than our Persian Don Juan. Mystery solved, sipping my morning coffee, I received a late comment from my friend, Maher Jawat saying he doesn’t think that this is the Persian Don Juan. What?! After all that work it could be someone else?! 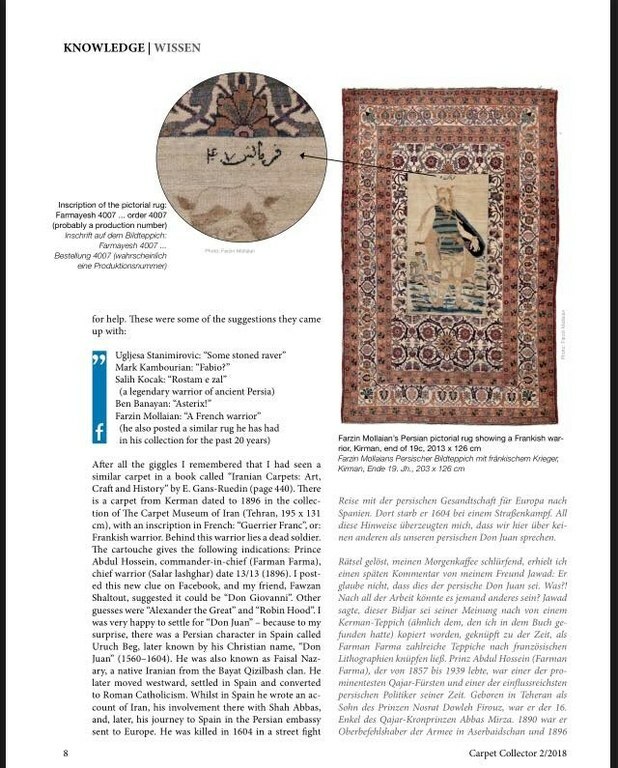 He mentioned that in his mind this Bijar was copied off of a Kerman carpet (similar to the one I found in the book), which was woven at the time that Mr Farman Farma ordered many carpets to be woven off French lithographs. Prince Abdul Hossein (Farman Farma) 1857 -1939, was one of the most prominent Qajar princes and one of the most influential politicians of his time, in Persia. He was born in Tehran to Prince Nosrat Dowleh Firouz and was the 16th grandson of the Qajar crown prince Abbas Mirza. He was the commander in chief of the army in Azerbaijan in 1890 and the governor of Tehran in 1896 as well as Kerman and Kurdistan. His last title was prime minister of Persia in 1915. 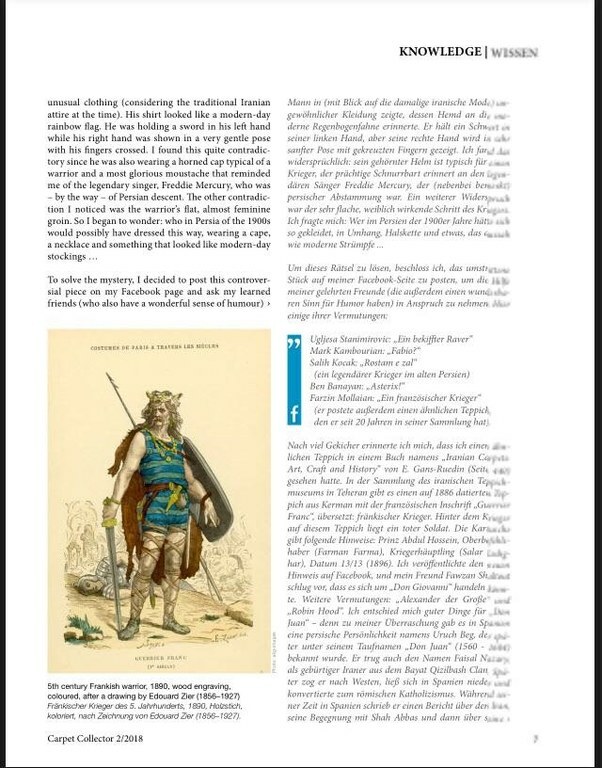 Maher also published a picture from Encyclopedia Britannica that eerily resembled the man on the carpet. Shocked by this discovery, I was back to the drawing board. Who was this mystery French warrior on the Bijar? I decided to research who the Frankish warriors were and I came across Clovis I. He was the first king of the Franks to unite all the Frankish tribes under one ruler and lived from 466 to 511. He is considered to be the founder of the Merovingian dynasty that ruled the Frankish kingdom for two centuries. Finding drawings of Clovis’ likeness convinced me that this is the man on the carpet. In French drawings however he is depicted as a very manly warrior, no gentle hand gestures, crossed fingers or flat groin...I can only conclude that the centuries of British and French conflicts and chilly relations resulted in each portraying the other as less masculine than the other. But at last the mystery is solved! Vive le Corvis!